My Husband said I Needed to Make a Garden Gnome. He’s a toy, but he also makes your soil more fertile wherever he is. if you want him to stay in one place, just shift-click to stick him down. (Bored norns can still push on him if they feel like playing.) Shift-click again if you change your mind. Regular-clicking mirrors his pose, if you want him to face the other way. His shirt color changes with the seasons, so a quick glance will tell you what time of year it is, if you need to know. Green means it’s springtime, yellow for summer, brown for autumn, and blue for winter. Very small update (6/10/12): I found and fixed a stupid little error that may have caused the problem Malkin pointed out, and also would have shown the wrong season sometimes. This one’s been hanging around for a while, just waiting to be finished. He’s pretty much the same as the other statues I’ve made — since he’s white, he adds some light, along with a little humidity. He comes in 3 sizes, which can be selected by clicking on him, and shift-click reverses his pose. 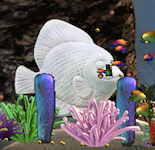 He’s also got underwater effects to make him look at home in aquatic areas. This is the first of my “next generation” of landscape elements / decorative items for C3/DS, which instead of just sitting around looking nice, actually make themselves useful to the environment in some way or another. I decided that statues would affect the lighting and moisture of the room they are in — increasing moisture, since they prevent evaporation from the part they’re sitting on, and changing lighting by casting shadows or reflecting light. Since the stone fish is white, it adds a bit of light. I’m also using a different approach to affecting CA levels than those I’ve seen. EMIT was too limited, since you can only affect one type of CA with it. ALTR wasn’t satisfactory, because either the levels kept going back to where they’d started, or they kept building and building beyond anything that would actually be “realistic.” So I’m using PROP, calculating the new level based on applying a multiplier against the value of the CA in the room when the agent arrived (if it’s 0, I change it to .01, since 0 isn’t realistic), and reapplying it periodically via the timer script. This approach is making me happy. It makes a slight change in the CA level that remains relatively steady over time. The changes are small. The multipliers are 1.1, 1.2, and 1.3 for the small, medium, and large sizes respectively. I have no idea whether those are “realistic” values, but they felt about right to start with. 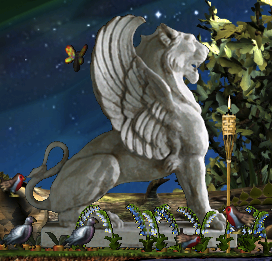 Incidentally, the StoneFish comes in 3 sizes, which can be selected by clicking on the statue. Shift-click reverses the pose.